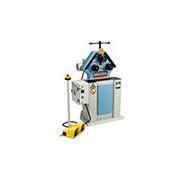 Are You Looking For A Good Used Metal Roll Machine? We have dozens of Metal Rolls for sale in stock..
Or Slip rolls are either pyramid type 2 bottom rolls and one roll stacked on the top, shaped like a pyramid or initial pinch 3 Or 4 Rolls with the 2 in front equal to each other. This produces a pinching action to pull your sheets and roll them into a round. 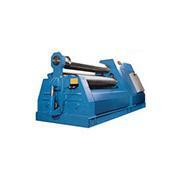 Used for rolling tube, pipe, bar and flats into cylindrical shapes. This machine uses different dies to form your piece. Rolling is a fabricating process in which the metal, is passed through a pair of rolls. In flat rolling, the final shape of the product is either classed as sheet (typically thickness less than 3 mm, also called "strip") or plate (typically thickness more than 3 mm).